The digital collection Crew Lists of the British Merchant Navy – 1915 has been created by the National Maritime Museum in Greenwich. Volunteers transcribed in a crowdsourcing project 750,000 names in some 39,000 crew lists. Some of the lists are held by the National Archives in Kew, their lists have not been digitized for this website. You can search for crew members (first name, surname, rank, vessel and birth place) and for vessels (vessel name and official number). The lists are formally crew agreements, official contracts. Women, too, served on merchant ships. The lists are also an important resource for family history and economic history. The page About provides background information, and you can benefit from the Frequently Asked Questions, too. The digital collection Éischte Weltkrich [First World War] has been created by the Université de Luxembourg, the Luxembourg Centre for Contemporary and Digital History, and the government of Luxembourg. The German army occupied Luxembourg at the start of the First World War. The website offers a chronology of events up to 1924, a number of themes for further exploration (occupation, grief and loss, hunger, the aftermath), an interactive map, and a collection with some 350 digitized items which you can filter by period and genre; you will find items from 1919, too. The section Resources contains six scholarly articles. There is also a section on education for teachers. This website can be viewed in French, German and English. The digital exhibition World War I comes to The Newberry has been created by The Newberry Library, Chicago. This exhibition touches several themes around the First World War, with for example attention to postcards, the role of engineers at the Western Front, the home front and the war economy. A second section focuses on the end of the war, the role of American women in rebuilding France and the return of refugees. In a numbe of sections there is only a narrative with references to items put on show, but without images or digital versions of them. The digital collection Les marchés de guerre 14-18 [Markets during the First World War] has been created by the French Ministry of Economic Affairs and its Centre des Archives Économiques et Financières (CAEF) at Savigny-le-Temple. On this website you can chose particular themes concerning French industries and public works (Recherche thematique) or a particular location (Recherche géographique) using an interactive map. A national commission investigated between 1933 and 1940 the workings of markets during the First World War. The section Focus brings you to four dossiers on major firms such as Peugeot and Michelin. The section Sources gives you a chronological overview of French legislation and information about themes such as taxation and war finance. You can also read an essay with background information by Béatrice Touchelay (Université Lille-3). This digital collection can only be viewed in French. The CAEF has also created a portal site concerning the First World War and the French economy. The website First World/Great War is an initiative of the Istorijki Arhiv Beograda [Historical Archives of Belgrade]. On this website you find a guide to historical records and archival collections in this city archive. In this guide ou can choose collections, themes and names from dropdown lists. There are articles on several subjects (e.g. economy, schools, health and the judiciary), and there is a timeline, a bibliography and a section with links to other relevant web sources. The image gallery shows you some highlights. You can visit this website in Serbian or English. The digital collection Letters of 1916: A Year in the Life has been created by Maynooth University. The aim of this project is to collect letters and postcards documenting the year 1916 in Ireland – more exactly from November 1915 to October 1916 – in all its dimensions, not only the Easter Rising and the Great War, but also daily life and business. Not only cultural institutions contribute to this collections. Individuals can give letters to be digitized or transcribe letters. At the start there were already some 2,200 letters. The letters can be searched freely or browsed for particular themes and months. 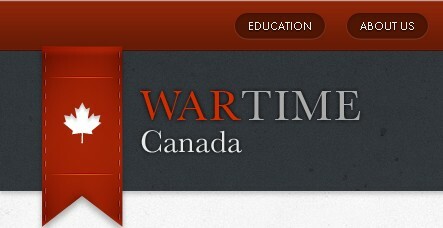 The portal Wartime Canada has been created by a team of the University of Western Ontario as an educational resource for teaching the history of Canada during both World Wars by using documents and artifacts to get closer to actual experiences. The resources at this portal are organized by ten category headings with a verb, such as Fighting, Eating, Relaxing, Remembering and Worshipping. The selection of themes under these headings is very wide and instructive. The section on education gives guidance to larger subjects such as the war effort, government and economy, identity and culture, historical inquiry and society. For each theme you can set the selection of items to either the First or the Second World War by choosing this period from a dropdown box. The portal can be visited in English and French.